Kids heading back to school? A new school year might be exciting for students — and maybe a relief to moms and dads — but for the pets, such a big shakeup in the family routine can be seriously upsetting. Here are a few tips to help ease the back-to-school transition for your four-legged family members. Your pets have had all summer to get used to the kids’ company. Now, between school and extracurricular activities, they’re faced with barely seeing their favorite little people on weekdays. While it’s natural for your pets to miss the kids, sudden separation from them can cause anxiety in both cats and dogs. Help avoid this by gradually getting them used to being alone. 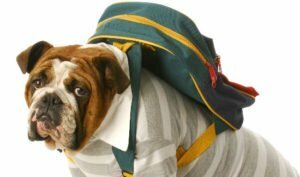 A couple of weeks before school starts, begin leaving the pets at home for a period of time. Each day, stay away a little longer until you’re gone for the amount of time they’ll be on their own. Be sure to introduce the same conditions they’ll face once school starts. For example, if you plan to crate or confine them during the day, do so during this stage as well. You wouldn’t want to be stuck at home alone with nothing to do all day, and neither do your pets. Provide plenty of toys and activities to keep them occupied. Hide small treats inside puzzle toys for dogs. For cats, tuck goodies away in clever hiding spots around the house so they can hone their hunting skills. If they’ll be left alone for the entire day, consider hiring a dog walker or pet sitter to stop in and provide company for a few minutes each day. Both cats and dogs can be wary of new items showing up. Cats especially are territorial and may resent the sudden appearance of book bags, sporting equipment, musical instruments and other back-to-school stuff — and they may express their displeasure in destructive ways. Try rubbing your kitty’s scent on a new backpack or trumpet case to help prevent any issues. Wipe your cat’s mouth area with a rag, and then rub the rag on the item. Also, allow cats and pups alike to sniff and inspect all of the new things. Of course, pets need plenty of exercise and mental stimulation, both of which will go a long way toward helping them behave during the day. Giving them regular attention also helps reassure them that they’re not forgotten when you leave. You can kill two birds with one stone by allowing time in the evenings for the whole family to play with the pets. This might include taking the dog on family walks after dinner, or trailing Kitty’s favorite toy around the house while he gives chase.